Rejuvenate yourself at the premier oceanfront cottage in Atlantic Beach. Relax on the warm deck, listening to the joyful sounds of ocean waves mere steps away. Skip down to the beach on your private pathway through the gently swaying sea oats. Watch as your children play in the sun-soaked sand on the shores of the dazzling Atlantic Ocean. Enjoy a sunset, then retreat to your home filled with beach décor, and rest in your choice of five bedrooms. In the morning, walk down the quiet beach to The Circle for some coffee, breakfast, shopping, or other activities. No matter what you chose to do, your stay at Sea Haven promises to add many wonderful memories to your vacation scrapbook! East Bedroom (Kids): 1 queen and 1 twin (4 occupants), accessed through parent's room. The main floor bathroom lies off the foyer on the main floor. New LG washer and dryers are located here. The second and third bathrooms are located between the bedrooms for convenient access (Jack & Jill style, with the bathrooms entered through the bedrooms. Both floors have independent thermostats and central heat/air units to optimize comfort. New flat screen TV's are installed as well. Sea Haven has terrific facilities for outdoor activities. The deck is exceptionally large at over 500 square feet, and has an attached shower shed (ambient temperature). There is also a covered 400 square foot porch with two large picnic tables, which are great for inclement weather or for just getting out of the sun. The view is unmatched...Sea Haven faces due south on an east-west beach, so during certain times of the year, you can enjoy both a sunrise and a sunset from the same location (this is one of the few beach locations in the US where this occurs). From the steps of the deck, the waves at high tide are only about 15 yards away. The location in Atlantic Beach is also a plus due to the wide variety of activities and restaurants available. Sea Haven lies in a quiet, relaxing neighborhood, yet still lies within walking distance of the Atlantic Beach Boardwalk and a fishing pier. Several restaurants are also within walking distance. THe beach in front of the house is relatively quiet, and you will often find yourself alone early in the morning. The official occupancy is listed at ten adults due to some recently enacted real estate regulations, but the house has 1 King, 6 Queens, and 2 twins (please reference the photos and below to see the bed layout). IF YOU ASK about the occupancy, you WILL be told 10 adults maximum. We don't want to deny you a stay, but if you tell us you have more than 10 people, we can't rent to you. We trust that you will bring the appropriate number of people, so no one will be counting occupants. For your convenience, when you arrive in Atlantic Beach, only the person on the contract needs to go check in with the management. The rest of your entourage can proceed to the house and wait for your family member to arrive with the key. With the number of beds, the cost per person is among the best you'll find for ANY ocean front home, making Sea Haven one of the best values on the beach. Additionally, in order to ensure quality service 24 hours a day and to make your stay as pleasant and trouble free as possible, we employ a professional management company which will cater to your every need. They offer a wide variety of services, and will provide you with the best vacation experience possible. We hope you enjoy your stay! If you have any issues that are not resolved satisfactory by contacting the management, please email me. VRBO does not work with our booking software, so the VRBO calendar may not be up to date. Please call for the most up to date info! Two garbage cans are available. If there is less than that, please let management know immediately. Garbage cans must be placed along the road in order to be picked up. Rod and Pat bought this house when they were Lieutenants based at MCAS Cherry Point. After finishing a mission, they would often fly over beautiful Emerald Isle on the way back to base. Finally, one summer day in 1992, Rodney went down to Atlantic Beach to see if he could find a home there, and on that day he found Sea Haven. Together Patrick and Rodney scraped up their limited savings and bought the house, which was in great need of repair. For the next 10 years, many weekends and holidays were spent renovating the home. Today, the house is a Carteret County historic home, and is one the finest examples of North Carolina beach cottages around. Rodney and Patrick are still buddies and both are retired from the Marine Corps, with over 40 years of combined military service. Rodney is married to Pernille from Denmark, and Patrick is married to Carrie from Florida. If you want something different and unique, this oceanfront house is for you. Sea Haven has that traditional beach cottage charm. Walls and ceilings are gorgeous Carolina pine, something you never see in new construction. As they say, location, location, location. 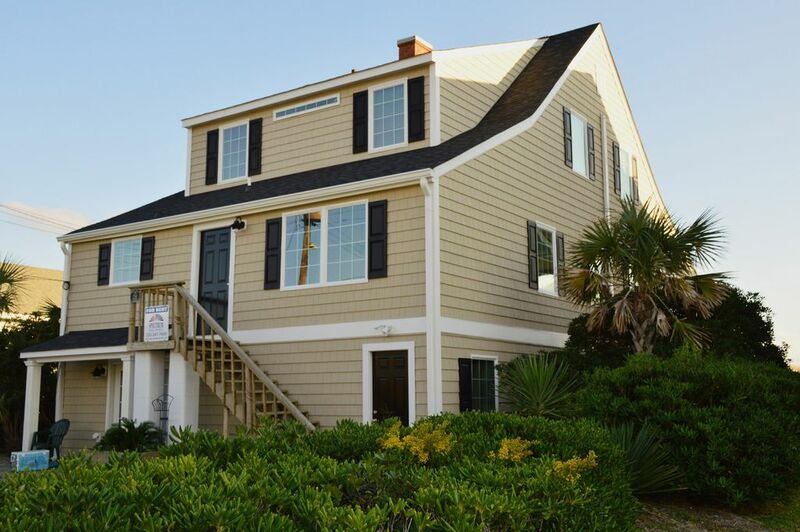 The house is on a quiet street conveniently located within walking distance (2 blocks) of the Atlantic Beach Circle and Boardwalk. Also within walking distance of some ocean fishing piers. The home is professionally managed by Spectrum Resort Properties, so you will always have assistance should you require it. Call for calendar info. 2 bathrooms have modern all glass frame-less showers. Top floor bathroom has a standard tub and shower, perfect for kids. This is a resort community. Directly on the ocean. Beach runs east to west, so can watch a sunrise and sunset on the same beach (depending on the time of year). Directly on the ocean. Can throw a rock into the waves from the deck. Must bring your own laptop. Small grass area on sides and back of house. Backs up the the beach dunes. Full kitchen (including cooking utensils) three indoor dining areas plus two picnic tables outside. W/D, M/W, CA/H, I/M, CTV, grill, fully furnished, large deck, deck furniture, private shower, large covered porch for inclement weather! Walking distance to boardwalk & 2 fishing piers, Great location in Atlantic Beach, where the fun is! Pet friendly (requires a deposit), No smoking indoors. There is also a small, one bedroom, quiet, occupied apartment on the lower level.